Compare Countertop Water Filtering and Purification Systems: Berkey, Zen Water or Katadyn? The treated water supplied to our homes can still contain some impurities and some bad taste due to the chemicals such as chlorine or fluoride used during the treatment. But even more important, for people living in rural areas where no water treatment is available, and where water is obtained from wells, or other sources such as lakes or streams, it becomes critical to eliminate impurities such as harmful bacteria, viruses and various unwanted contaminants. Water filter pitchers provide good filtering for tap water for a small number of people and needed mainly for drinking. But for those who need to filter also harmful microorganisms that can be found in non-tap water, and who need to filter water not just for drinking, but also cooking, and for larger families, water filter pitchers are not adequate. They need more powerful larger filtering and purification systems that can be readily available on their kitchen counters, kitchen tables, kitchen floor or elsewhere in the house. These larger and powerful systems come mainly in two forms: they are either under-sink systems driven by water pressure or countertop systems driven by gravity to accomplish the filtration. Note that in this review we will be considering only the countertop water filtering and purification systems. If you prefer under-sink systems, please click the following link: ﻿Under-Sink Water Filtering and Purification Systems﻿. * They filter extremely well, even harmful microbiological organisms such as bacteria. * They do not need electricity or water pressure as they are gravity driven. * They are perfect for emergency situations since no electricity is required. * They do not require any special installations or connections. * They come in a number of sizes that can respond to all needs, including some portable models. * They don't have to be placed by the sink, under the sink, or to be attached to the faucet, tying up useful space. They can be placed anywhere on the kitchen counter or anywhere else in the house. You will find below a detailed description of Berkey, Zen Water, and Katadyn Systems, followed by product recommendations on Amazon. Berkey Water Filtering and Purification Systems can be used to filter both municipality treated water and untreated water from such sources as wells, lakes, streams, etc. They do not require electricity or plumbing, they are BPA free, and there is minimal assembly. The systems are composed of an upper chamber and a lower chamber. The upper chamber houses the two self-sterilizing and re-cleanable Black Berkey filters. The pores within these filters are so small that no harmful parasites, bacteria or even viruses can pass through. These systems are able to eliminate chemical and pathogenic contaminants such as chlorine and bacteria to levels higher than 99.99%, while leaving in minerals that are beneficial to health. The Black Berkey filters have replaced the older ceramic filters that were used initially with Berkey systems. Though the ceramic filters can still be bought and work with all the various models of Berkey filtering and purification systems, you should definitely choose the Black Berkey Filters as they perform better. Where the Berkey systems distinguish themselves from many other filtration systems is in their capability, through the use of optional special fluoride filters housed in the lower chamber, to reduce significantly fluoride content. When one considers that over 60% of our municipal water is fluoridated, this becomes a very desirable feature. These special filters, referred to as PF filters, also remove any arsenic content that may be found in the water. The PF fluoride reduction filters screw onto the bottom of the Black Berkey or the older ceramic filters. Note that if you need fluoride filters, when your Berkey has Black Berkey filters, you will need the PF-2 fluoride filters, and when your Berkey has ceramic filters, you will need the PF-4 fluoride filters. ​​Travel Berkey:1.5 gall. capacity, and can filter and purify 2.75 gallons per hour. This is the smallest model, suitable for traveling. Berkey Light: 2.75 gall. capacity, and can filter and purify 4 gallons per hour. Good for about 3 people. Big Berkey: 2.25 gall. capacity, and can filter and purify 3.5 gallons per hour. Good for about 3 people. Royal Berkey: 3.25 gall. capacity, and can filter and purify 4 gallons per hour. Good from 4 to 6 people. Imperial Berkey: 4.5 gall. capacity, and can filter and purify 5.5 gallons per hour. Good from 4 to 6 people. Crown Berkey: 6 gall. capacity, and can filter and purify 6.5 gallons per hour. Good for 12 people and up. There is also the Go Berkey Kit which is portable, comes with a compact Berkey system, sport bottle, and carrying case. It can be used for various activities such as backpacking, hiking, camping or world travel! All Berkey systems, except for the Berkey Light, are made of high-grade polished stainless-steel. The Berkey Light is made of a non-BPA copolyester, They all come with 2 self-sterilizing and re-cleanable Black Berkey filters. The fluoride filters are often also bundled into the purchase. The Berkey Light is about three pounds lighter than the equivalent capacity stainless-steel system, and therefore can also be taken easily outdoors. The Travel Berkey is the smallest of the stainless steel systems. It is compact enough to fit within a suitcase, as the upper chamber can be placed inside the lower chamber when traveling (note that the Berkey Light does not allow for that). they are the only TRUE gravity based countertop purification grade systems on the market today. Zen Water Systems use a multistage filtration system that is supposed to mimic the process undergone by a natural mineral spring to transform tap water into healthy and clean drinking water. The filtration system removes harmful bacteria, contaminants, chemicals and other impurities, eliminates bad odors, adds essential minerals, and regulates pH level to mildly alkaline. Zen Water systems do not require electricity or plumbing, they are BPA free, and there is minimal assembly and instructions. They are composed of an upper chamber and a lower chamber. Water flows from the upper chamber to the lower chamber when filtered. The systems come with all the necessary filters: a micro-ceramic filter, a multistage mineral filter cartridge, and mineral stones. The micro-ceramic filter is in the shape of a dome which sits in the top chamber. The surface of the dome consists of millions of pores that measure 0.2 to 0.5 micron in diameter. Note that most bacteria are 0.5 to 1.0 microns in size while viruses are about one one-hundredth the size of bacteria. This means that the dome will filter bacteria but not viruses! The micro-ceramic filter will trap dirt, contaminants, and most bacteria before the water flows down into the multistage mineral filter cartridge housed in the lower chamber for further filtration and purification. Only natural water-filtration materials are used to purify tap water, without the use of chemicals or other synthetic substances. To use, you simply fill the top chamber with water, and let gravity and the multistage filtration system do the work. 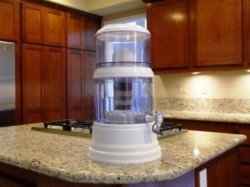 Note also that Zen Water systems can be used at home or outdoors, and they can be placed on the kitchen counter, or on a water cooler. Replacement filters are made to fit all Zen Water models. - 4-Gallon Countertop: Measures 13 x 13 x 22 inches and weighs 9 pounds when empty. 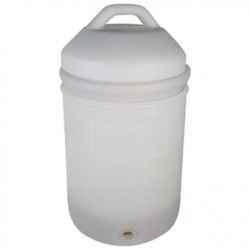 - 6-Gallon Countertop: Measures 13 x 13 x 24 inches and weighs 10 pounds when empty. Though Zen Water is an excellent product, keep in mind that it will not remove viruses and will not filter fluoride. Zen Water warrants their water filtration systems to arrive free of damage and defect in workmanship. If problems are found, products have to be returned within 30 days. No other warranty is provided. The Katadyn free-standing water filtering systems are equipped with a 2.64 gallons (10 liter) water reservoir for for filtering large quantities of water. They can be used with non-tap water originating in streams, wells, lakes, etc. as they are able to kill or inactivate harmful microorganisms like bacteria, and eliminating harmful chemicals and impurities. Like the previous two products discussed, the Katadyn is a gravity based system, therefore no pumping of water or electricity is required. This makes it ideal for camping and other outdoor activities. It can serve from 1 to 6 people. - The Ceradyn: with three ceramic filters. - The Gravidyn: with three ceramic filters with activated carbon core. The pore-size of Katadyn ceramic filters is 0.2 micron. This is sufficient to remove bacteria, but not sufficient to remove viruses. Both types of Katadyn filter systems consist of two stacked PBA free high quality and durable plastic containers. To get filtered water, you simply fill the upper reservoir with unclean water and let gravity pull the water down while filtering it through the three ceramic filter elements. The water drips into the bottom reservoir equipped with a spigot for easy access to the clean water. The above Katadyn Water Filter Systems come with a 1-year limited warranty. Katadyn also makes a Pocket Water Microfilter designed for outdoor enthusiasts and international travelers. It features a silver-impregnated ceramic filtering element that's effective against bacteria and protozoa even in extreme conditions. It can filter all microorganisms larger than 0.2 microns, producing clear and drinkable water anywhere. This is the only water filter with a 20-year warranty! See below if interested. So Which Filtering and Purification System Is Best? The Zen Water and Katadyn systems will remove bacteria but will not remove viruses. 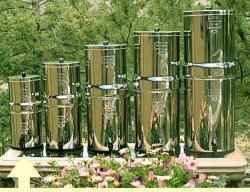 The Berkey products claim to kill viruses. So, if the water you intend to filter is known to contain bacteria, but no viruses, you could safely use the Zen Water or Katadyn water filtering systems. Otherwise, you might want to consider a Berkey! If you want to get rid of the fluoride in the water, you might want to consider the Berkey systems which provide special filters for fluoride and arsenic removal. These filters are either bundled into the purchase or are optional. Even though the Zen Water and Katadyn systems are made of BPA free solid and durable plastic, if you are looking for the sleek stainless steel look to match other stainless-steel appliances in your kitchen, then you should consider a Berkey which offers stainless steel models. Finally, if the higher cost of Berky systems is an important factor for you, keep in mind that the two filters provided when you purchase a Berkey system represent filtration of 6000 gallons! And at about 10 gallons a week of water usage, this comes to more than eleven years of filtered water without having to replace any filters, and represents a cost of less than 2 cents per gallon. So, in spite of the higher initial price, the Berkey represents a great deal. You can purchase your Berkey filtering and purification system right here on Amazon. Please click the Berkey of your choice below to see the exact price or to purchase. Note that all six selections below come with 2 Black Filters and 2 Fluoride Filters. You can purchase your Zen Water filtering and purification system right here on Amazon. Note that when you click below, you will be offered 2 different sizes of Zen Water Systems (4 Gallon and 6 Gallon) to choose from. You can purchase your Katadyn fitering and purification system right here on Amazon. Please click the product of your choice below to see the exact price or to purchase.